How exactly did Bob Odenkirk blow up like this? And actually, why did it take him so long? And why is he most famous for his smallest contribution to show business (a supporting character onBreaking Bad)? All these questions pop into my head when I think of the place Bob Odenkirk has in pop culture these days. The man has created some of the most important comedy of our time, like Mr. Show. He has written and directed movies, and has even written a book. And now he’s released a standup album? That just opens up a whole can of worms. I guess we should just accept that Bob Odenkirk is as ubiquitous as he is invisible. There’s plenty to talk about on Odenkirk’s first standup album. First off, this is his first standup album? Knowing that Odenkirk runs with the same group as established standup comedians David Cross, Paul F. Tompkins and Brian Posehn, that’s just crazy. 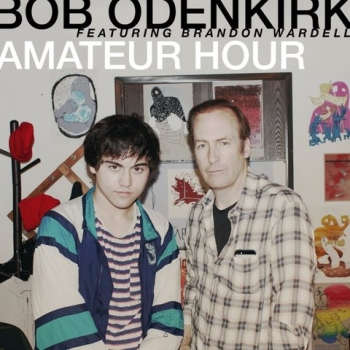 Second, Odenkirk shares the album with Brandon Wardell, a young comedian who’s set, although decent, makes for an odd inclusion on this album. Third, the last four tracks are part of a sketch where Odenkirk advises young up-and-coming standup comedians on how to succeed in the business, assuming they want to do so in the 1920s. Fourth, and most importantly, this album is absolutely hilarious, full of witty and offbeat one-liners and the absurdist humor that Bob Odenkirk does so well. It all seems to come out of nowhere, and the success rate is probably due to the fact that these are all well-crafted words. In the sea of standup we are sitting right now, Amateur Hour still finds a way to stand out. Maybe because it’s actually smart. There’s really nothing like this album Odenkirk has put together, and God knows when or if he will ever do it again. So maybe the first time is the charm, in this case. Amateur Hour is out now. Buy it here on Amazon .